In 1859 Astronomer Richard Carrington observed the largest recorded Solar Flare generating a massive CME ( coronal mass ejection). It can take such ejecta from 14.6 hours to 3 - 4 days to reach the earth. This ejecta reached earth in just under 18 hours (17.6h). Telegraph systems failed throughout Europe and North America. Sparks shocked operators and set the telegraph paper on fire. operators removed the batteries powering the lines. In the Rocky Mountains; miners got up and started making coffee; thinking it was morning . Aurora Borealis were seen in the Caribbean. SO: What's the Big Deal? A SOLAR FLARE DOES WHAT...? When a Solar Flare sends Plasma heading for Earth, the Earth's Magnetosphere blocks most of it; but does undergo certain changes. When the Earth's magnetic field configuration changes ... large amounts of direct current electricity can surge through the power grids here on earth. This can blow out the power grid transformers and melt the copper wiring inside them. Quebec, Canada experienced just such an event in March of 1989 when 6 million customers were without electricity for 9 hours. 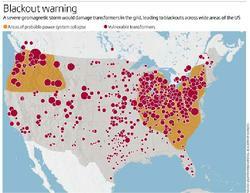 When the transformers blew out during Hurricanes Katrina, Gustav, and Ike in 2005 and 2008; only 9 hours without power would have been welcome compared to 9 days to a couple of months or more. If a flare manages to hit the Earth, it will take about 2 hours to pass the Earth by. Whatever part of the Earth is facing the flare when it happens is going to lose all Electricity. No water (electricity pumps the water ... gets it to your place) and purifies it... no gas, no light, no air-conditioning, etc. If a CME kicks out a big enough "plasma ball" and it gets to the Earth's Magnetosphere when the earth's magnetic fields are either compromised or are at odd angles to each other; then the plasma can't "slip over the earth" very well. 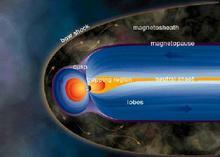 When that happens, the Magnetosphere opens like a gutted fish and all that Plasma just "rains on in". That would NOT be good. The Next Solar Maximum when lots of sunspots occur which are usually indicators of strong or intense magnetic fields on the surface of the Sun ....was expected in 2012... now expected closer to 2013. On Friday, March 10, 1989, an explosion on the Sun released a billion-ton cloud of gas which then headed for Earth at a million miles an hour. On Monday, March 12th, the cloud of Solar Plasma struck Earth's magnetosphere. On Tuesday, March 13th, Just after 2:44 AM the Plasma found a weakness in Quebec's power gird and in less than 2 minutes the entire power grid of Quebec lost power for 12 hours. For millions of people the "lights suddenly went out". The entire province of Quebec, Canada experienced an electrical blackout an auroras were seen in Florida & Cuba. In the USA, New York Power lost 150 megawatts and New England's Power Pool lost 1, 410 megawatts. Service to 96 electrical utilites in New England was interrupted while other reserves were rapidly brought online to restore power. Satellites in space went out of control for several hours and NASA's communication satellites (TDRS-1) recorded over 250 anomalies. The Space Shuttle Discovery had sensor problems on one of its hydrogen tanks; registering unusually high pressure readings on March 13th. The Stewart Solar Flare occurred at almost the exact moment of this Eclipse. 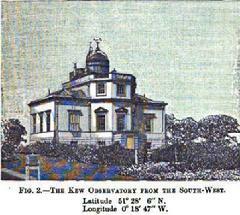 at Kew Observatory - London, England. Could the findings from the Carrington Event Chart reveal Indications for future Solar Flare Events? leading up to .... or in 2012?